A longtime favorite of mine, Robin Hobb—also known as Megan Lindholm—has continuously amazed me over the years with her wonderful fantasy series including the Farseer trilogy, the Liveship Traders, the Tawny Man and now her Soldier Son trilogy. Unsurprisingly, ever since I started Fantasy Book Critic, a personal goal of mine was to hopefully one day interview Ms. Hobb and now thanks to Jack from EOS Books, that dream has become a reality! 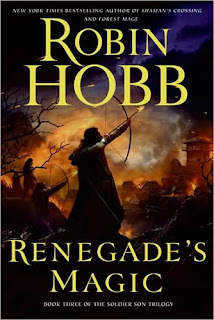 And just in time to coincide with the US release of “Renegade’s Magic”, which concludes Robin’s Soldier Son trilogy :) So read on as Robin discusses her new book, a Rain Wilds standalone novel, her stance on the SF/fantasy genre, the printed word and a whole lot more! Q: Most fantasy readers I believe are acquainted with Robin Hobb, but for those who haven’t sampled your work yet, how would you describe your writing style, what book should they pick up first, and what can readers expect from your fantasy novels? 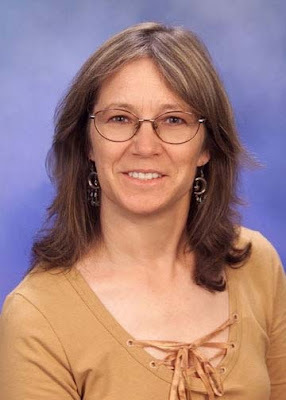 Robin: I would describe my writing style as both leisurely and intimate. I write fantasy that is character driven, but I like to think my plots are strong, too. I attempt to have the reader connect deeply with the viewpoint character so as to really enter the world. I think that “Assassin’s Apprentice” would be an excellent place to start reading and decide if you like my style. Fitz is one of my favorite characters. And what can readers expect from my books? I hope a very good story and a bit of escapism. Q: “Renegade’s Magic”, which was released via Voyager in the UK on July 2, 2007, is the third and concluding volume in your most recent trilogy (Soldier Son) and is finally making its US debut on January 8, 2008 (EOS Books). Compared to the other two Soldier Son books, what was it like writing “Renegade’s Magic” and how do you feel about the way you closed out the series? Robin: For me, writing a trilogy is a single task. I break the manuscript into three publishable pieces, but I don’t really pause between books or see each piece as a separate entity. For that reason, probably the hardest task of beginning the third book was remembering that readers do experience a year’s gap between books and therefore plot points and characters should be re-introduced with enough information to either jog the memory or give the entering reader a place to start. Retreading ground without being obvious or boring is a really difficult task. I felt like the book ended pretty much as I had expected it would from the beginning, so that was satisfying. Q: After you completed the Farseer trilogy, you thought you were done writing about Fitz and the Fool, but eventually you followed up with the Tawny Man trilogy. Regarding the Soldier Son series, will we ever see you continue Nevare’s story or return to that world, and if so, what factors would be necessary to make it happen? Robin: I feel very satisfied with how Nevare’s story ended. I think it’s always possible to write a sequel to any book, but I’m not sure at all that is always wise or necessary. As I’ve said about Farseer, I would return to those characters and that world only if I had an absolutely compelling and wonderful plot idea. To write a novel without those elements would be unfair to the characters, the readers and to me. Q: So have any “absolutely compelling and wonderful plot ideas” come to light that have inspired you to write another series in the Farseer world ;)? Robin: I am currently working on a book set in the Rain Wilds. It will be a single volume not a trilogy or series. Chronologically, it takes place after the events in “Fool’s Fate”. Events that occur in the Farseer, Liveship and Tawny Man trilogy will enter into the plot. However, it does not involve Fitz in any way. Q: Can you give us any other info about the book? Robin: It does not continue the adventures of any character from one of the earlier books. My ambition is that it will truly stand alone as a story. Q: Some of the other projects you’re working on include a collection of short fiction written under both Megan Lindholm and your pseudonym Robin Hobb, and a short story contributed to the Warriors anthology edited by George R. R. Martin and Gardner Dozois. What’s the progress report on these and any other projects that you’re currently involved with? Robin: I think you’ve given out as much detail there as there presently is to share. Works in progress tend to change a lot as I work on them. So any details I gave now might be untrue by the time the books appeared in print. I’ll just stay that I’m currently hard at work on the Rain Wilds novel and leave it at that. Q: Fair enough :) Now one of your greatest strengths as a writer is intimate characterization. What’s the key to writing strong characterization and how important is it in making a story successful in comparison to the plot, worldbuilding, etc.? Robin: Thank you for that compliment. When I read, I enjoy well constructed characters, so it is something I strive for in my own books. I think the key to strong characterization is taking the time to develop the character. For me, that means putting in details and incidents that may not directly move the plot forward but are very important to letting the reader know who the character is and thus why he makes the choices he does. The pacing at the beginning of any of my books is usually a lot slower than towards the end of the book, simply because so many words are given over to character construction. The first book of any trilogy is usually pretty thick with character building, which is, to me, as important as world building. Sometimes excitement and a quick pace have to be sacrificed for the sake of creating a character that people can really know and identify with. But once you’ve really established the character, I think the plot can have far more impact for the reader than if the reader was dealing with a character he didn’t know and care about. Q: Looking back, what have been the biggest improvements that you’ve made as a writer since you were first published and do you wish you could get better in any areas? Robin: I think I have learned to slow down and enjoy the entire writing process. When I first began writing longer forms, there were always scenes that I wanted to rush forward and write. 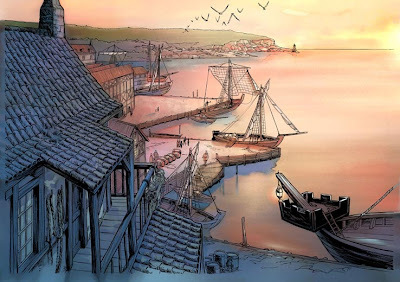 But when I didn’t slow down and construct the ramps up to that exciting scene, when I propelled the reader directly into it, it lacked the impact and significance I wanted it to have. If I write, “Joe had been Ed’s best friend since childhood. One night Joe got drunk and accidentally ran over Ed.” That seems more like a joke than a devastating occurrence. If I don’t take the time to show you how important Ed is to Joe, and what interesting people they are, then this event is just a throwaway moment in the book. What do I want to be better at? Everything! Q: I read in an interview that you want to write everything: “Mysteries! Snarky, sarcastic short stories! Horror! YA. Children's books. Poetry.”, and that you’ve even completed “two urban fantasies, a YA fantasy, (and) a children's Christmas story.” Nowadays, it’s becoming more and more common for novelists to branch out and experiment not just in a different genre, but in a whole other medium altogether like comic books, television, movie scripts, videogames, etc. If you were to ever branch out into a different medium, what would you like to try writing and why? Robin: I’d love to be involved in creating a movie. Note that I said ‘be involved’ not ‘write a screen play.’ I do think that writing for a visual production of a story is a very special skill, and I’m not sure it’s one that I have. But I’d like to be a part of seeing that happen, so that I could learn about the whole process. And I’d like to make an attempt at writing a YA book. In my vast amount of spare time, of course! Q: Regarding comic books, there’s actually a French graphic novel adaptation of the Farseer trilogy by Laurent Sieurac in development. As a comic book fan, I think this is pretty cool, so I was wondering if you could outline how this project first came about, what exactly the plan is regarding publication/distribution, how involved you are with the adaptation, and if there will be an English translation? Robin: I was approached about doing a graphic adaptation and gave permission. As that is well outside my area of expertise, I have not been at all involved, though I’ve been very pleased with the bits I’ve seen of it so far. It looks as if it is coming together beautifully. As far as I know, there are no plans for an English adaptation. Q: Has there been anything else optioned for adaptation (film, television, videogames, animation, etc.) or any interest? If so, could you share any details? Robin: Well, you didn’t specify it had to be one of MY books, so I’ll tell you my favorite fantasy. Hayao Miyazaki would do an unflinching and faithful anime adaptation of Kipling’s Jungle Book. I mean, the whole Jungle Book, with the red dogs of the Deccan and the King’s ankus and Kaa’s hunting told true to the books. And everyone would be stunned and amazed and overnight, the sales of The Jungle Book would shoot through the roof as people finally realized it wasn’t about singing bears. So, on a related note, with entertainment becoming more technology-based, which in turn is becoming more and more advanced, is the print format in danger of becoming extinct, and what can publishers & authors do to adjust to the changing times? Robin: Extinct. No. Humanity has trusted paper to preserve its information for a long, long time. Consider this. I can easily open and read fairy tale books that were given to my father when he was a boy. Know what I can’t open? The stories that I carefully saved to my 51/4 inch floppies in a Kaypro format. And I don’t think I’m the only one with that sort of problem. Paperbacks did not make hardbacks become extinct, and I think that for the next hundred years at least, you will see digitized ‘disposable’ copies of text and ‘keepsake’ books. I know that if I have a book I want my grandchildren to read, I wouldn’t buy it as an e-copy right now. I’d purchase a top quality hard back that would be permanently available to anyone for the next hundred years or so. Books also have an important physical presence that a lot of the ‘extinct paper’ arguments ignore. Do you think that Dr. Seuss and bedtime stories will work as e-copies? I suppose eventually I’ll push a button and the text and pictures will light up on the ceiling screen in the child’s bedroom. But it will develop slowly, and writers and publishers will adapt one pixel at a time, just as we are now. Look how you’re doing this interview, for example. Email questions and emailed answers. So we’re definitely moving into the digital age. Nonetheless, I think paper books will be around far longer than I am. Q: You make some excellent points! Moving on, you’ve been publishing books since the early 80s and have been producing novels on a regular basis during that time. From what I’ve read, there doesn’t seem to be any shortage of new ideas, yet surely you must suffer through bad days or slow periods. What helps you persevere and to keep writing? Robin: There’s a big queue of stories inside my head, and when I stop writing, they all pound on the walls and start shouting, “Is it my turn yet? I’m much better than the story you’re trying to write right now. If you don’t write me soon, I won’t make sense anymore!” So, a shortage of ideas is never the problem. Bad days are when everything conspires and I never get a straight shot of time at my keyboard. There is nothing worse than having fifteen lines of perfect dialogue in your head for twelve hours. And then, when you sit down and start typing, only the first five show up and the rest have evaporated! Q: Since you’ve been writing for as long as you have, what are your thoughts on the evolution of fantasy and science fiction and where do you see the genres’ going in the future? Robin: This genre will go wherever it wants to go, just as it always has! It’s why I love it so. It’s infinitely adaptable. SF and fantasy intermingle with all the other genres, mystery, romance, western, etc. It masquerades as video games. It has taken over movies. Sometimes it sneaks out there and pretends to be a mainstream novel and people buy it and think it’s something really new and amazing. And, of course, it is. I think it is also the genre most adaptable to technology. The same people who are willing to open a book and say, “I trust you. Take me for a ride,” are the ones who will be willing to experiment with a new media for story telling. Q: What a lovely response :) So after everything you’ve accomplished so far, what still challenges you? Robin: Being organized. Keeping my life in balance. Remembering not to become so deeply engaged with one thing that I forget there are meals to eat and a car to wash and a garden to weed. Being a whole person. Q: It’s been said that authors of genre fiction, especially female writers, get little respect from writers of non-speculative fiction. Have you had to deal with any such problems and what are your thoughts on the subject? Robin: Pssst. There is no such thing as non-speculative fiction. I’d never tell the poor dears that, of course. Seriously, no. For one thing, I don’t have much to do with mainstream writers or, actually, writers of any stripe. That isn’t prejudice on my part; it is simply geography and inclination. I live in Tacoma and most of the writers I know live up in Seattle or down in Oregon. That’s too far to travel for casual get-togethers. Online, I may interact with other writers, but not in my day to day life. My friends are a surgical nurse, a carpet-layer, several landscapers, some teachers, a retired bird biologist, etc. Oh, and lots of people of a maritime persuasion, due to my husband’s career. And when we are talking, it’s seldom about my writing or respecting it or disrespecting it. So it’s really not an issue in my life. Q: Are there any preconceived notions that you’d like to dispel about being a female speculative fiction writer? Robin: I work. Really. I know that it looks like I’m home all the time, doing nothing when you drop in. But believe me, every one of those words gets typed, one character at a time, and it does take time. Q: In the past year, three of fantasy’s great authors passed away in Robert Jordan, Madeline L’Engle and Lloyd Alexander. Is there anything you would like to say? Robin: Well, the boomer generation is starting to age, and the obituaries are just going to get thicker and thicker as time goes by. So treat all people, not just writers, very well while they are around. Send your Aunt Tillie a nice note and a bunch of flowers because you don’t get to have those people forever. I look at the people I’ve lost and I always ask myself the same questions. “Why didn’t I reply to that letter right away?” “Why didn’t I ask him to tell me about his experiences during the war?” “Why didn’t I take more time with that person?” If you are a writer, you know that people are the first and best resource for your writing. Our nursing homes are full of people who are full of information that isn’t written down anywhere. It’s yours for the taking, hundreds of amazing stories. Get them while you can. Q: What is the one question that no one has ever asked you in an interview, but you wish they did, and how would you respond to it? Robin: Oh, I can’t really think of a good response to this right now! Probably a month from now, the perfect question will pop into my brain. Q: I know that you’re busy with your writing, family and so on, but have any books been grabbing your attention lately? Robin: I recently read “The War Journal of Lila Ann Smith” by Irving Warner. He’s created a fictional narrator and journal framework to tell the story of a little known incident in Alaskan history. During World War II, when the Japanese successfully invaded and captured the Aleutian Island of Attu, they actually packed up an entire village of Alaskan natives with their possessions and transported them back to Japan, where they remained for the duration of the war. It’s often true that real historical events can be more fantastic than fantasy or science fiction. I enjoyed the character and voice he created as much as I was fascinated by the lives of the villagers transported to Japan. Q: What about new writers? Is there anyone you’d like to plug? Robin: Well, Brandon Sanderson isn’t exactly new, but I’ve recently read and enjoyed his fantasy Mistborn. It has a very unique system of magic in the book, and a fascinating world. Need I say more? Q: Do you have anything else you’d like to say in conclusion? Robin: I think you’ve covered it all very well! 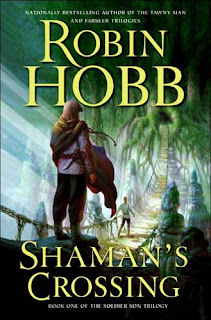 For updates, please do drop in at Robinhobb.com My homesite is a bit of a fun house, but for the less adventurous, there is a clear set of links on the first page that will take you to my upcoming schedule for my US book tour in January. 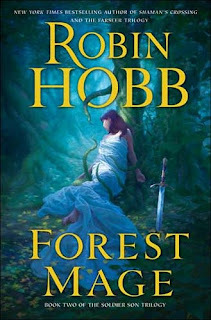 For even more on Robin Hobb including information about her pseudonym, why she prefers writing in a first-person perspective and the trilogy format, fan/critic feedback on the Soldier Son trilogy, cover art, etc., I’d recommend reading her recent interviews with UK SF Book News, Pat’s Fantasy Hotlist and A Dribble of Ink. What happened to the '2007 Review/2008 Preview: A Writer’s Perspective' post? Very good interview, thank you! :) It was nice to read new questions for a change instead of the old ones that always get repeated.